Rebecca Felton’s brief and essentially symbolic service in the Senate stood in contrast to her decades of participation in Georgia politics and civic affairs. Outspoken, determined, and irascible, Felton was involved in public life from the 1870s through the 1920s. She first entered politics during her husband’s successful campaign for the House of Representatives and went on to work as a lecturer and newspaper writer, before becoming the first woman to serve in the United States Senate. 1Robert Preston Brooks, “Felton, Rebecca Latimer,” Dictionary of American Biography on CD–ROM (New York: Charles Scribner’s Sons, 1998; originally published in 1931). The children were John, Mary Eleanor (died in infancy), William Harrell, Jr., Howard Erwin, and Paul Aiken (died in infancy); Hope Chamberlin, A Minority of Members: Women in the U.S. Congress (New York: Praeger, 1973): 25–26. 2Chamberlin, A Minority of Members: 26–27. 3Ibid., 28–29; W. Fitzhugh Brundage, “Felton, Rebecca Latimer,” American National Biography, 7 (New York: Oxford University Press, 1999): 808–810. 4Brundage, “Felton, Rebecca Latimer,” ANB. 5Chamberlin, A Minority of Members: 19–21. 7“Statue Unveiled to Vice President of Confederacy,” 9 December 1927, Washington Post: 2; “Mrs. Felton, Once Senator, Is Seriously Hurt in Crash,” 4 March 1929, Washington Post: 10 ; “Georgians Mourn Mrs. Rebecca Felton,” 27 January 1930, New York Times: 19. Papers: In Medora Field Perkerson papers, 1905-1966 (bulk 1920-1960). Papers: 1835-1930. 4,812 items. Letters, speeches, scrapbooks, articles, clippings, accounts, sheet music, and greeting cards chiefly pertaining to Georgia politics, women's rights, the temperance movement, penal reform, education, religion, banking laws, and other national and state affairs. Finding aid. Chamberlin, Hope. "Benefit of the Doubt," A Minority of Members: Women in the U.S. Congress, 19-37. New York: Praeger Publishers, 1973. Felton, Rebecca Latimer. Country Life in Georgia in the Days of My Youth. 1919. Reprint. New York: Arno Press, 1980. ___. My Memoirs of Georgia Politics. Atlanta: Index Printing Co., 1911 (memoirs of William H. Felton, written by Rebecca Felton). "Rebecca Latimer Felton," in Women in Congress, 1917-2006. Prepared under the direction of the Committee on House Administration by the Office of History & Preservation, U.S. House of Representatives. Washington, D.C.: Government Printing Office, 2006. Floyd, Josephine Bone. 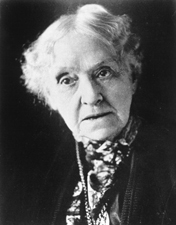 "Rebecca Latimer Felton, Champion of Women's Rights." Georgia Historical Quarterly 30 (June 1946): 81-104. ___. "Rebecca Latimer Felton, Political Independent." Georgia Historical Quarterly 30 (March 1946): 14-34. Hirsch, Eleanor G. "Grandma Felton and the U.S. Senate." Mankind: The Magazine of Popular History 4 (1974): 52-57. Hunter, Joan Conerly. "Rebecca Latimer Felton." Master's thesis, University of Georgia, 1944. Mellichamp, Josephine. "Rebecca Latimer Felton." In Senators from Georgia, pp. 224-29. Huntsville, AL: Strode Publishers, 1976. Talmadge, John E. "Rebecca Latimer Felton." In Georgians in Profile: Historical Essays in Honor of Ellis Merton Coulter, edited by Horace Montgomery, pp. 277-302. Athens: University of Georgia Press, 1958. ___. Rebecca Latimer Felton: Nine Stormy Decades. Athens: University of Georgia Press, 1960. ___. "Rebecca Latimer Felton, Georgian." Georgia Review 9 (Spring 1955): 65-73. ___. "The Seating of the First Woman in the United States Senate." Georgia Review 10 (Summer 1956): 168-74. Whites, LeeAnn. "Rebecca Latimer Felton and the Wife's Farm: The Class and Racial Politics of Gender Reform." Georgia Historical Quarterly 76 (Summer 1992): 354-72.